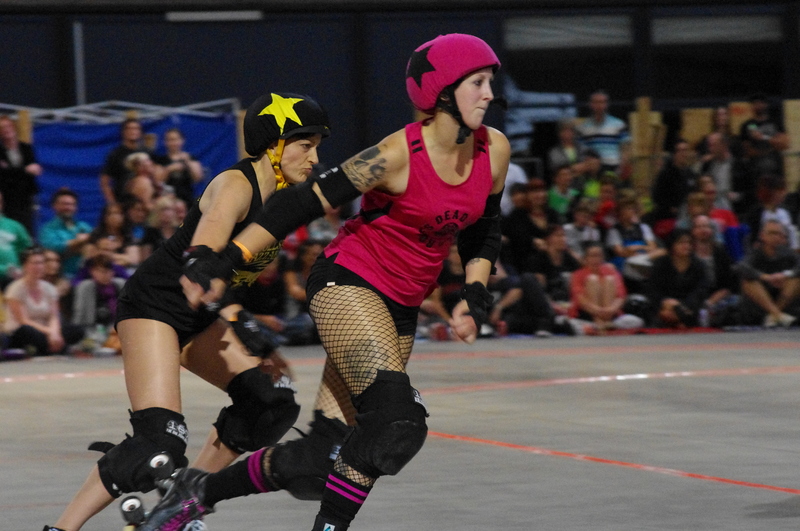 So the Victorian/Tasmanian Roller Derby Tournament 2013 is in full throttle mode! 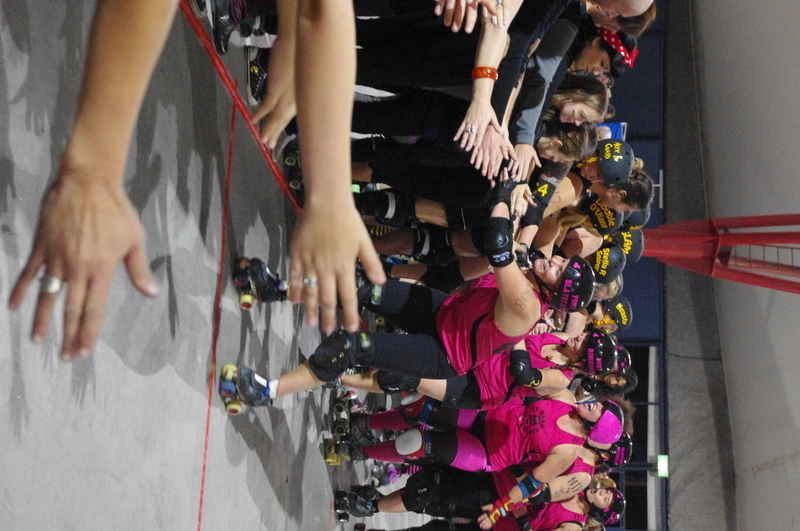 The Victorian Tasmanian Roller Derby tournament is an ambitious undertaking to have as many leagues as possible in both Victoria and Tasmania play in 2013, culminating in finals determining a champion league. This is really really exciting news! 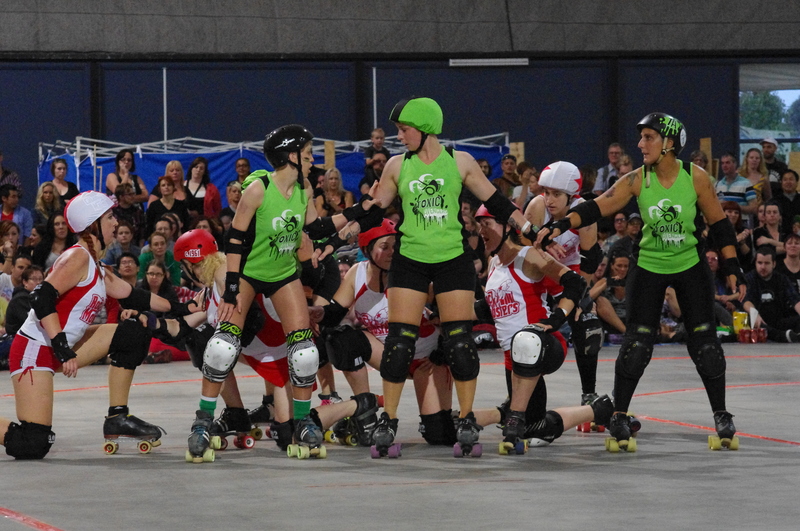 The groupings have been announced and we have been placed in Group 2 alongside fellow Victorians Geelong Roller Derby League and Ballarat Roller Derby League and two Tasmanian leagues (both from Launceston) Van Dieman Rollers and Devil State Derby League. We will be holding try outs in a few weeks time to rank our skaters that will form our Travel A team squad (the Death Stars) for the tournament this year. Within that top 20 skaters our Captains will be nominated and voted in and planning and training for this event will amp up TO THE EXTREME! I am incredibly excited about this tournament this year. 16 leagues across these two states are getting involved. It fosters a greater derby relationship across all levels (regional leagues, experienced metro leagues, up-and-coming leagues) and more derby action for the fans out there. High-five to ALL OF THE DERBY!!! 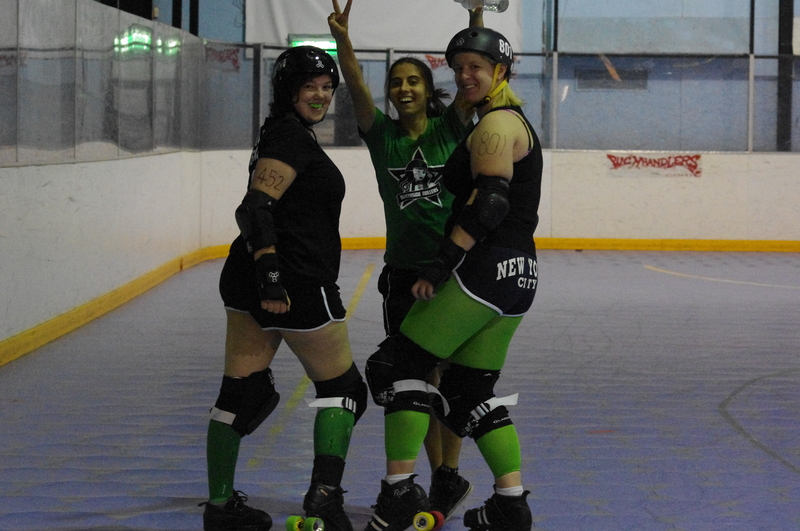 On Easter Saturday my league (Northside Rollers) put on an Open Scrimmage Extravaganza!! Our very own Bonnie Crash worked her magic with organising this event, opening the invite to the surrounding leagues to come and play! 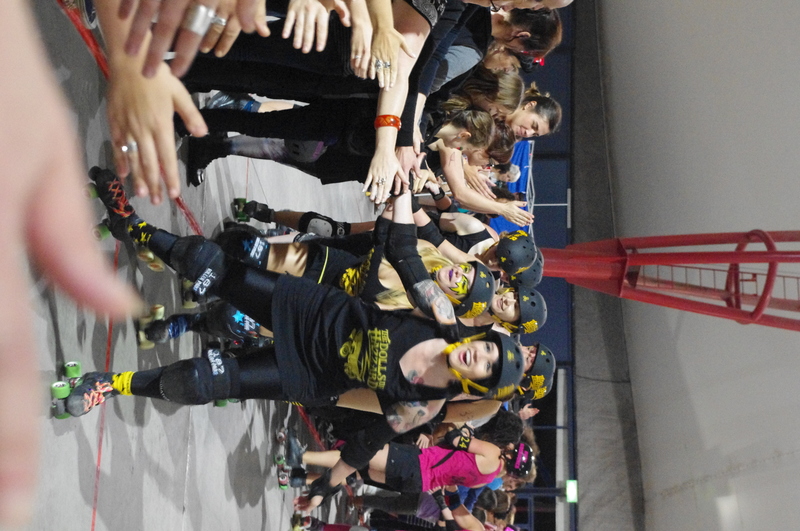 We ended up having skaters join us from Ballarat Roller Derby League / Diamond Valley Roller Derby Club / East Vic Roller Derby / Geelong Roller Derby League / Latrobe City Roller Derby / Murray River Derby Dames / South Sea Roller Derby / Victorian Roller Derby League and Westside Derby Dollz. 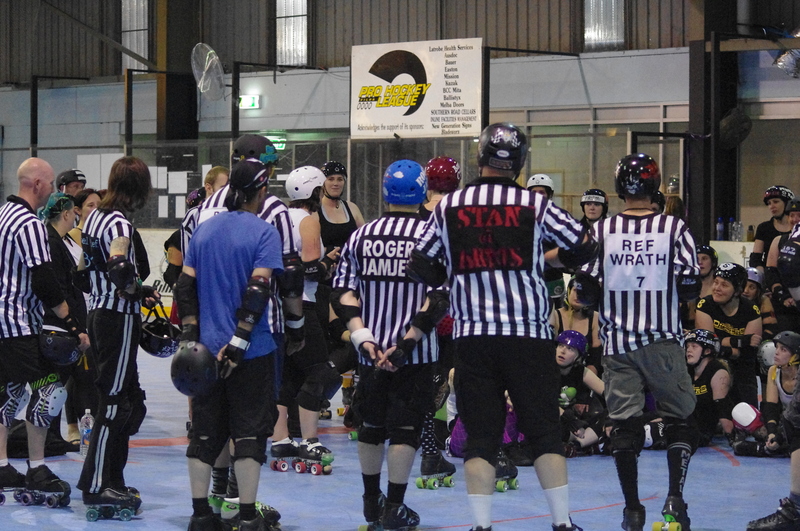 We had about 70 skaters in total and a full contingent (and then some) of visiting Refs! It was an awesome sight to see as we all warmed up on the track. Leading up to the day we were told which team we were on and to wear a black or white scrimmage top. 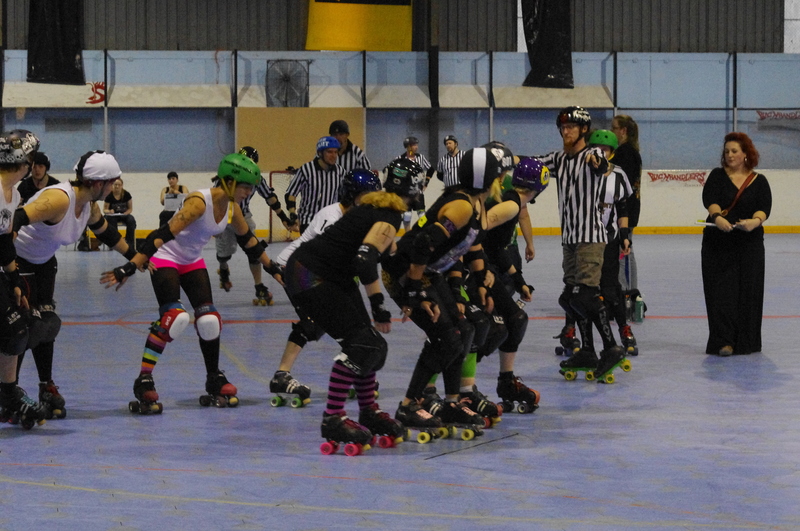 The day was to run with the first hour being an Amber scrimmage – which meant skaters could positional block and use light surging ONLY – no hard hitting! The second hour was Green scrimmage which was full contact. The 2 teams lining up. I went in for both scrimmages. You would line up and the Jams would just rotate through the line. Pretty much everyone went in for Amber so the wait to get a turn to skate took a little longer than the Green hour. It was so great to see some of the newer skaters get in there and have a go, plus some of the Vets helping them out and giving advice. Mingling in the line it was great to chat to other skaters from other leagues just to hear their game play and strategies. Hanging out with Donna Slay in the Black line. I don’t think I’ve ever heard that many whistles blow at the end of a jam as I did that day. We had so many refs involved with this scrimmage it was just fantastic! 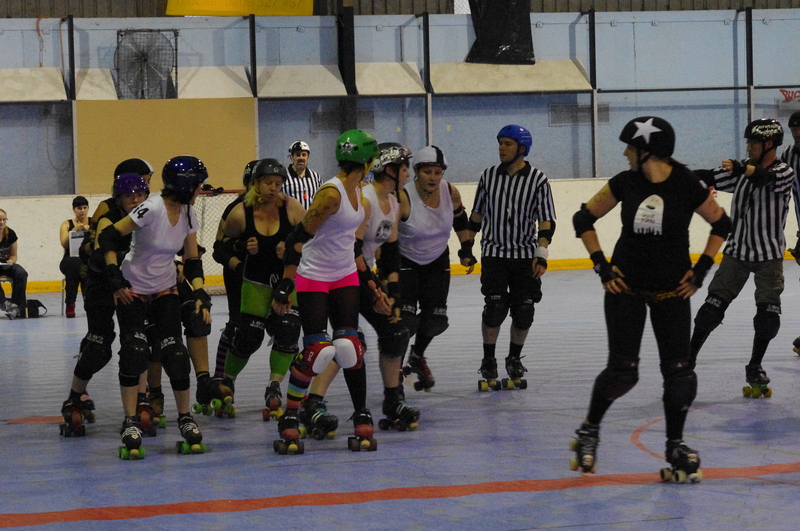 There were a couple of funny moments, especially when skaters who weren’t familiar with the venue (and the white track that is laid) kept cutting the track in a major way and we got a very vocal reminder from Ref Fan Boy of which line the track was. It was such an Awesome day all round. 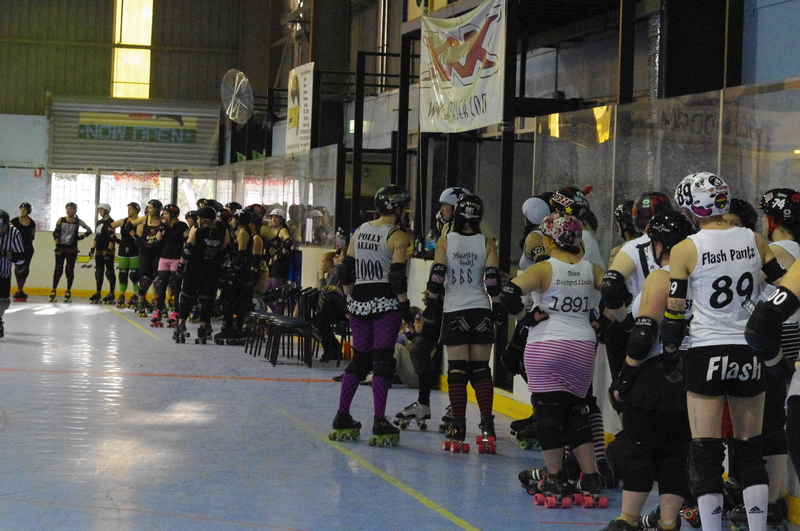 Just to skate with all different levels, chat to girls from other leagues and learn things from them too! 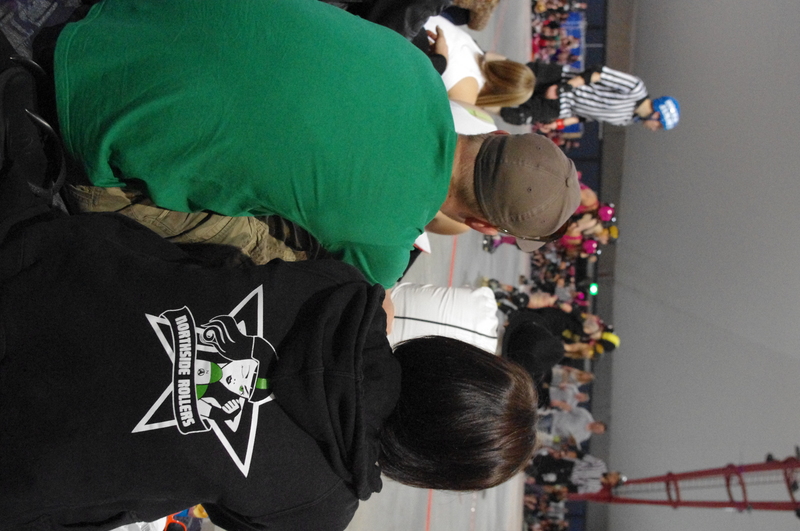 There really was a whole lot of derby love floating around that day. Lots of smiles and laughs, I did not see any douche-bag behaviour whatsoever! High five Northside for putting on an Awesome day out! Hope we get to do it again someday soon, it was a fantastic derby day!! Afterwards some of us converged on the Raccoon Club (again, in 2 days!?) and enjoyed plenty of “Easter” alcohol, only to be witness to some AH-Mazing interpretive dancing, hip-checks in back alleys and some dance-offs in lounge rooms! 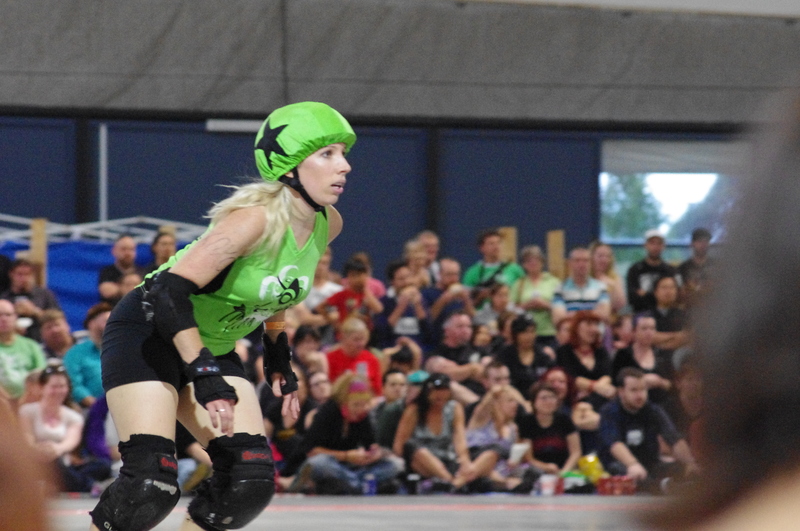 PS: Thanks to Stax for letting me throw the camera at her when I was in with the Green scrimmage so she could take some photos for me! 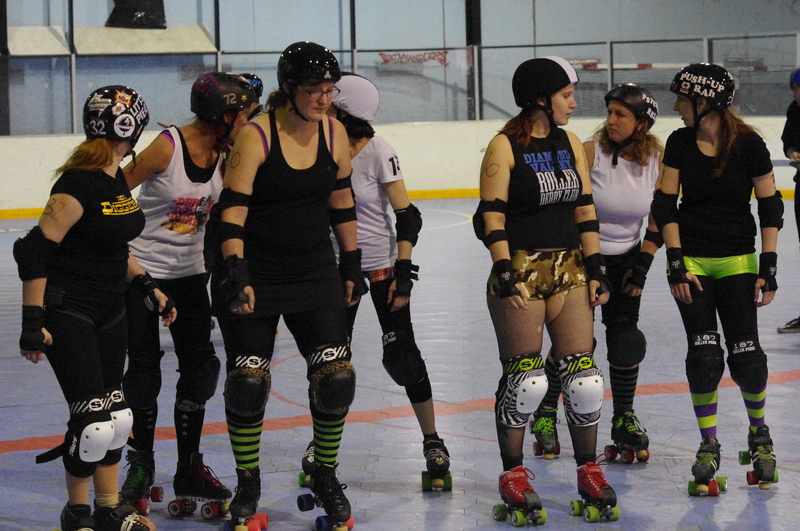 On Saturday we had Peggy Oh Kneel from Ballarat Roller Derby come guest train us. We started with an off-skate warm up of skipping and leg exercises then it was on skates for one of the hardest endurance sessions I’ve had in awhile. There were pace lines drills and track sprints and timed pack skating and jammer starts and agility drills and lots and lots of skating hard and fast. I almost puked. Twice. Then we scrimmaged!! I was definitely feeling exhausted by the end of it all, and it was hard work trying to stay focussed and scrimmage. It was hard work. For me. I pushed myself as much as I could and I felt it. I AM still feeling it! I know one of the ways I am going to get better and quicker is to train at that intensity, I will probably hate it, and whinge and moan, but it’s needed. I need it. 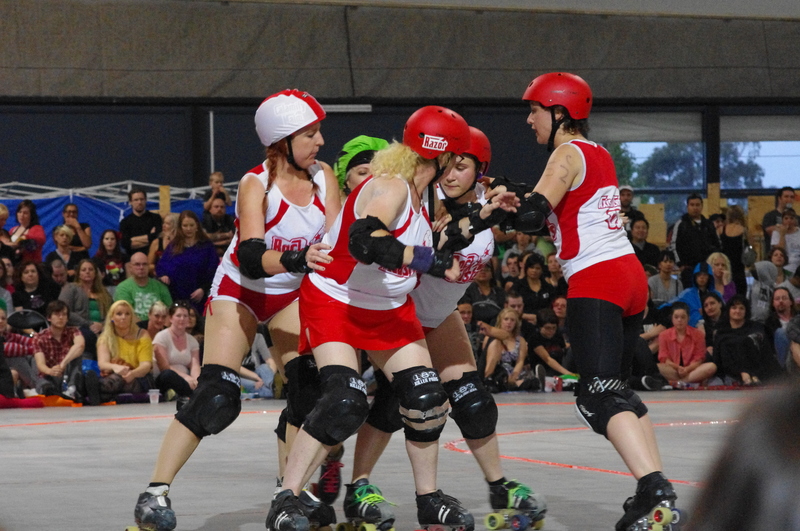 After training a bunch of us piled in to Bliss Star’s car and headed to the VRDL second double header for the season. 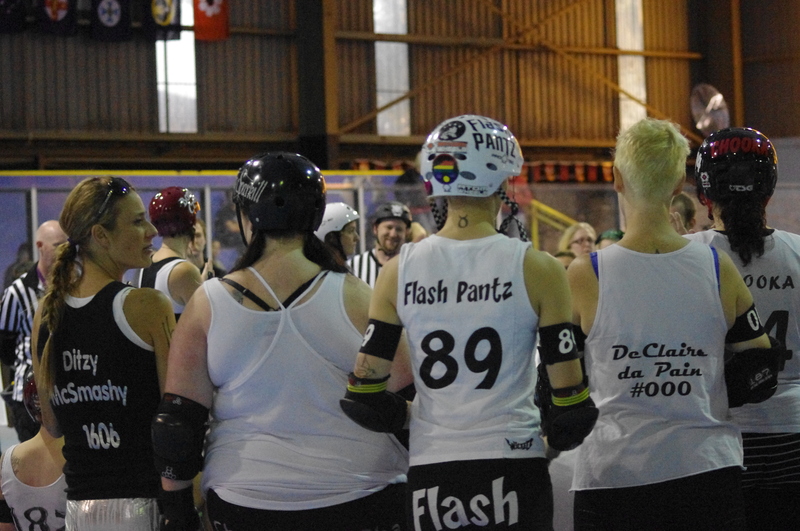 My mind really wasn’t on reviewing the bout this time, I was kind of still reeling from training… so all you get this time round is some photos! Enjoy! We only caught the tail end of the first bout (therefore not many pics) Final score the Toxic Avengers 184 VS the Rock Mobsters 115. Kitty Decapitate played for the Toxic Avengers this time around. An awesome Mobster wall holding back the Toxics jammer. 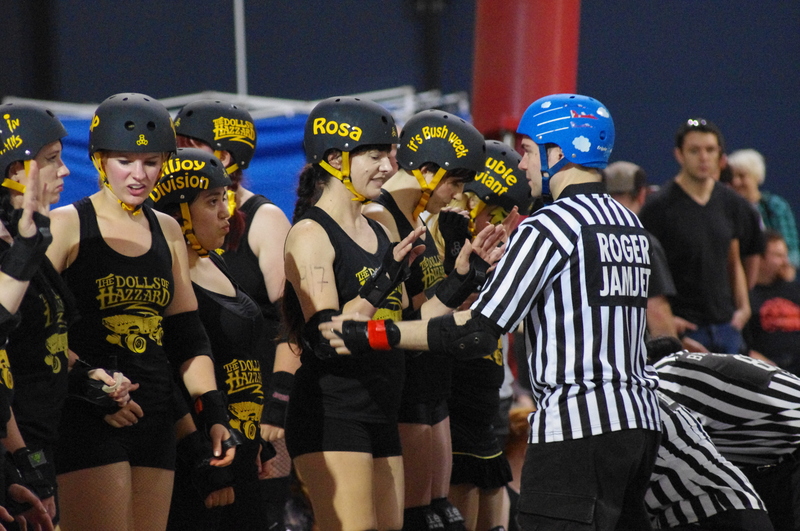 Second bout was the Dead Ringer Rosies VS the Dolls of Hazzard. 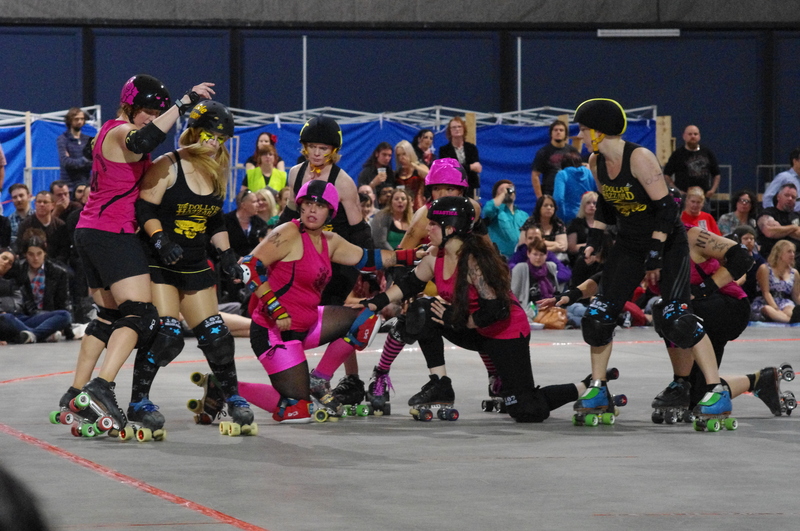 Rosies came up roses (hurr hurr) defeating the Dolls 210 to 118. Styx and Skate Bush jamming it out. 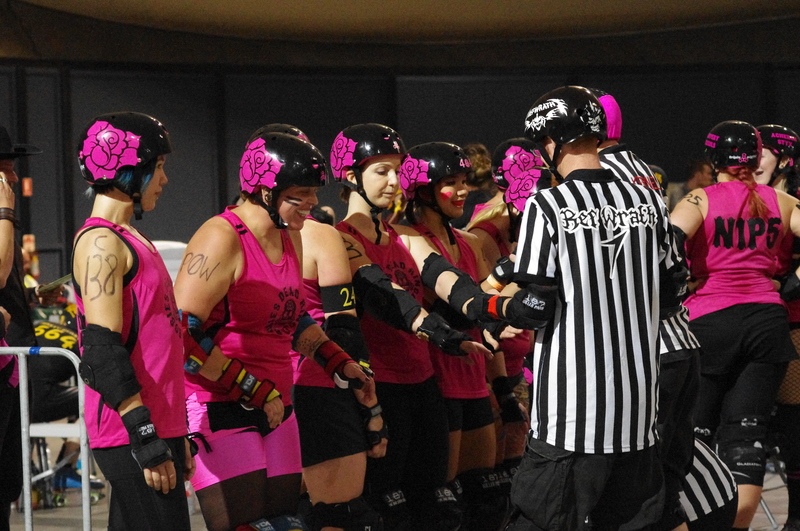 I was watching the Rosies during a time-out and it was the best moment. 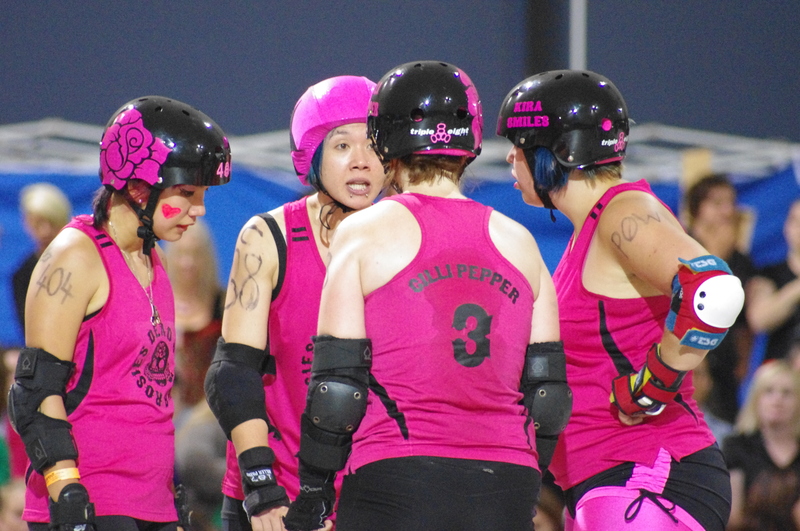 Swish was so animated discussing plays so passionately with her team. It was awesome to watch! Saturday was a good derby day. Great (exhausting) training. 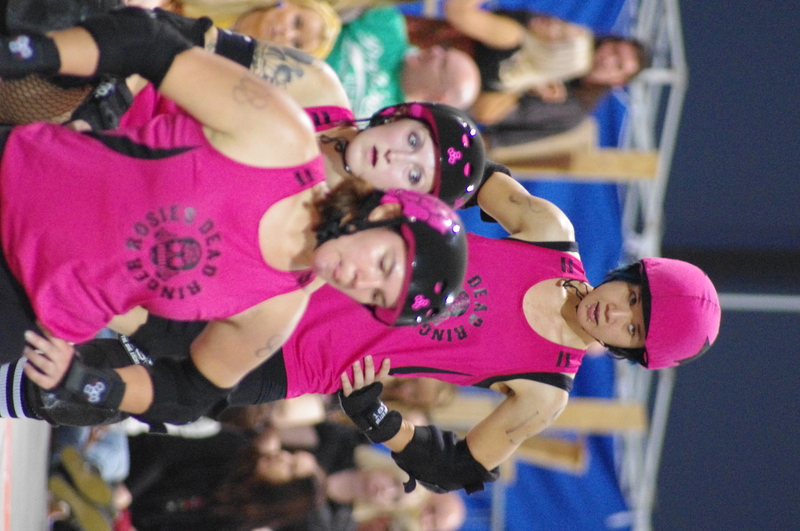 Some good derby to watch at the VRDL bout(s), and great to watch it with some Northside girls! High five to that!! 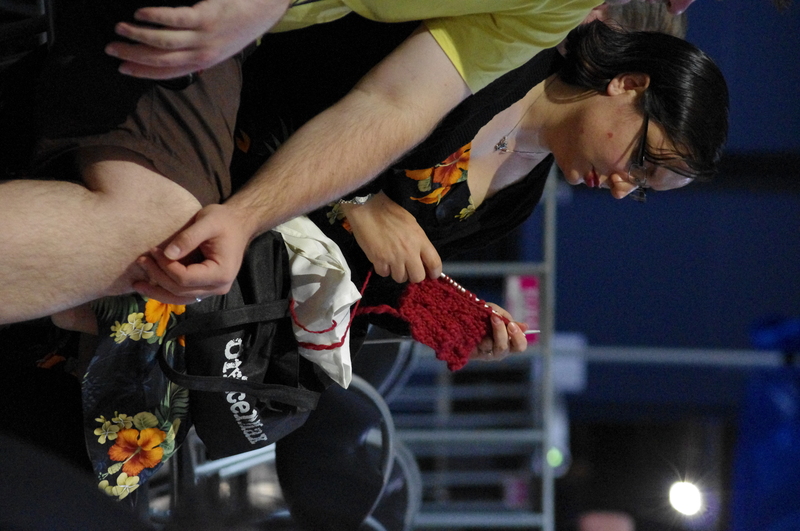 …though I think this lady wasn’t so keen on watching the bout, she preferred to knit!? DUDE! You cannot do everything!! !